The Thermo Scientific Lab-Line Titer Plate Shaker is rugged, and robust and simple to operate. A non-skid surface and retaining springs act to keep the titer plate securely in place and can hold four plates at once, while rubber feet at the corners keep the shaker instrument from walking down the counter. Within the titer shaker, the continuous duty rated motor is high torque, full ball-bearing construction and ceramic permanent magnets. 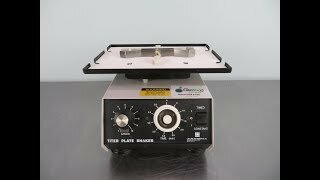 With a precise 0.120- inch orbital shaking motion, the Thermo Scientific Lab-Line titer plate shaker has a speed range from 40 to 1100 rpm giving you anything from gentle rotation to aggressive agitation. Agitations can be set to constant or timed up to 5 minutes, lending itself to uniform repeat runs. This Thermo Scientific Lab-Line Titer Plate Shaker is fully tested and in working condition. If you have any quetsions please don't hesitate to call.